I got some help with a code that lets me plot a variable in real time. However, I am having problem plotting 2 variables or inputs on th same plot. When I try to plot both inputs, it somehow combines the value and plots a single point for both. Not as famaliar with this plot method and not a 100% sure if it's even possible to do what I'm trying to. Does you all have suggestions or other things to try? "When I try to plot both inputs, it somehow combines the value and plots a single point for both"
at the bottom of your function to ensure handles.grab_max is updated properly, but that is not relevant to the particular problem you are describing as far as I can see. Hey Adam, thanks for responding. I added the update line. It plots another point (different value - 0 or close to 0) on the same line instead of making a second line on the same graph. 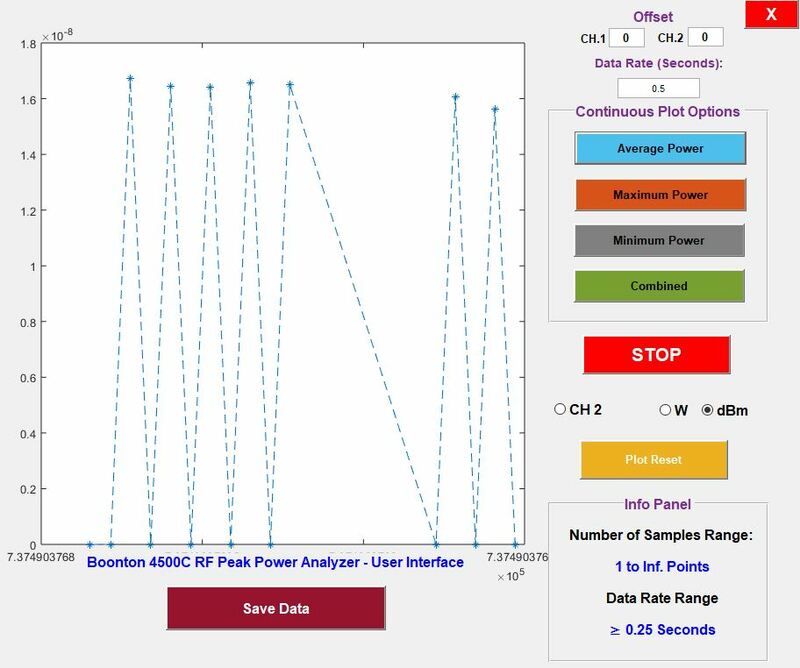 Updating plots using the method above will add to the same line, that is its purpose as it is far more efficient to do this than to keep replotting the same data just with an extra point added. If what you want is a seperate plot though then you will need another plot instruction instead. Thanks Adam. Is that as in I need to make a second set of axes to plot to? Do you have other suggestions for what I'm trying to do, please? instruction, where hAxes is the handle of your axes. Hey Adam, sorry to keep bugging you. I added a hold and tried to plot in the same space. I got the following. Any ideas how I can decouple them? Are there supposed to be 2 plots there? I can only see one. Well, that's the problem. They're both plotted on the same line. I tried to plot both lines on the same plot, but it combined the results. I believe the higher points are grab_max points and the lower point from grab2_max points. If they are being plotted as two explicit plot instructions this should not happen, even if you are updating each one as you go using the above syntax, you should be updating 2 distinct line objects with the points for each. there and you are giving it both your grab_avg and grab_avg_t data. You need to distinct plot handles to update, one for each, if I understand correctly the result you want. Hey Adam. I had shown the code above to show what produced the plot I showed earlier. Hey Adam, thanks so much for all your help. I've gotten it to work. I tweaked the code a little with both plot objects. I was not handles the individual objects properly at first. Thanks so much again.